Hello everyone! Can you believe it's February? I sure can't! February is a busy month for me with a few birthdays (one my husband's tomorrow) and Valentine's Day. I do love Valentine's with all the red and pink. Today, I am posting over at Twine it Up! with Trendy Twine. I have a super quick treat box and 3x3 card to show you. 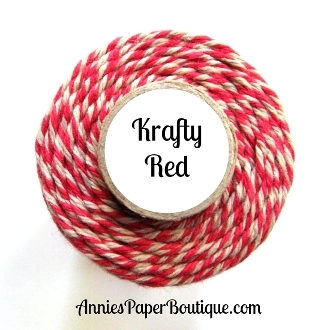 We are featuring the Krafty Red Trendy Twine and the Kraft Tags with Metal Rims this month. 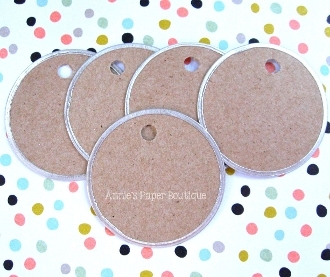 The treat box is the 2 inch Kraft Box from Annie's Paper Boutique. I cut out the card stock panels for each side slightly smaller than 2 inches. Then I wrapped the Krafty Red Trendy Twine around the sides and tided it at the top, attaching my Kraft Tag that I stamped with my sentiment. The Love Arrow Woodies are also in the store and are so fun! I attached it with Glossy Accents. I used a ton of fun goodies from Annie's Paper Boutique, so I do hope you check it all out and buy your Valentine goodies! I love the cute you decorated the Kraft box and adorable card!! This is such an adorable set! I love the colors and the papers you used. Your gift set is fabulous! I love the way you embellished the treat box! The wooden arrow is adorable! Your card is so pretty too! What a GREAT project Helen!! So very cute! Love all the fun embellishments. I am totally sweet on this project! Adorbs for sure!